In this study, we aimed to investigate the laryngeal electromyography (L-EMG) findings of organic and functional laryngeal pathologies that affect superior laryngeal nerve in patients with hoarseness. All patients underwent routine examination and videolaryngoscopy using a 70-degree 4-mm telescope. L-EMG studies were performed via portable Dantec™ Keypoint® EMG/ NCS/EP Workstation with 2-channel options. For EMG, 20 mm bipolar concentric needle electrodes were used. Because the procedure was relatively painless and local anesthetics could affect the function of the muscles, no local anesthesia was administered to the patients. Cricothyroid muscle (CTM) and thyroarytenoid muscle (TAM) were tested by electromyography method. Twenty-four patients with hoarseness were included in the study. Eleven patients (46%) were male and 13 (54%) were female. The mean age was 37.62 years (range: 15-57 years). A total of 96 muscles were examined with EMG. L-EMG was pathological in 15 patients (62.5%) and bilateral pathology was observed in three patients. Twenty muscles (20.8%) were detected as pathological, with neurogenic involvement in 20 muscles (70%), poor activity or no activity in four muscles (20%) and dystonic activity in two muscles (10%). Eight right CTMs (five neurogenic involvement, two poor activity, one no activity) and five left CTMs (two neurogenic involvement, one poor activity, two dystonic activity) were pathological. TAMs had neurogenic involvement on the right side in four patients and on the left side in three patients. It should be kept in mind that L-EMG may be an adjunctive application for detecting pathologies with neurogenic or myogenic involvement that affect the superior laryngeal nerve and lead to hoarseness. Laryngeal electromyography (L-EMG) is a study that evaluates the integrity of the muscles and nerves of the larynx. The movements of the vocal cords are coordinated by laryngeal muscles, laryngeal cartilages, brain and nerves innervating the laryngeal muscles. Diagnostic L-EMG is indicated in patients with signs of movement disorder in vocal cords. The aim of the diagnostic L-EMG is to elucidate the cause of these movement disorders and to guide the diagnosis. Laryngeal movement abnormalities may be due to joint dysfunction, muscular anomalies, and central or peripheral neural disorders involving the larynx. It is important to understand the etiology of movement disorder for developing an effective treatment algorithm. Although evidence-based data confirming the usefulness of L-EMG is very few, it has proved to be very useful clinically. Diagnostic L-EMG is performed to evaluate the integrity of the laryngeal neuromuscular system. L-EMG works by using electrical signal transmission of nerves. Electrodes receive electrical impulses from muscles and convert them into visual and sensory signals, and these signals are interpreted (1). The superior laryngeal nerve (SLN) is the branch of the vagus nerve. It branches from the vagus nerve near the jugular foramen at the skull base, usually about 4 cm superior to the carotid bifurcation at the level of second cervical vertebra and ganglion nodosum. After approximately 1.5 cm, SLN branches into the larger internal and the smaller external branches. The external branch lies on the surface of the inferior constrictor muscle and innervates cricothyroid muscle (CTM) (2). The CTM is responsible from the tension on the vocal folds and allows patients to create high-pitched sounds. Damage to SLN makes it difficult for patients to create high-pitched sounds. This is a big problem especially for singers and women (3). In this study, we aimed to investigate the EMG findings of organic and functional laryngeal pathologies that affect superior laryngeal nerve in patients with hoarseness. Twenty-four patients with hoarseness were included in the study. Patients with hoarseness due to laryngeal malignancy and patients with previous history of thyroid or laryngeal surgery were excluded. However, three patients who had had radiotherapy due to nasopharyngeal carcinoma about one year ago and had no relapse were not excluded from the study. All patients underwent routine examination and videolaryngoscopy using a 70-degree 4-mm telescope. L-EMG studies were performed via portable Dantec™ Keypoint® EMG/NCS/EP Workstation (Medtronic Co, Skovlunde, Denmark) with 2-channel options. This study was appoved by the Local Ethics Committee of İstanbul University Cerrahpaşa Faculty of Medicine (date: 2005, number: 08). Informed consent was signed by all patients. Because the procedure was relatively painless and local anesthetics could affect the function of the muscles, no local anesthesia was administered to the patients. For EMG, 20-mm bipolar concentric needle electrodes (Myoline, Spes Medica, Genova, Italia) were used. In order to test CTM, the skin over the cricothyroid membrane was pierced 1 cm lateral to the midline with a monopolar needle electrode. The CTM was tested by moving the needle to the upper lateral part of the cricothyroid membrane until the electrical activity was observed on the oscilloscope and heard from the speaker system. We placed the needle electrode over the midline of cricothyroid membrane in order to measure the activity of the thyroarytenoid muscle (TAM). The needle electrode was inserted through the cricothyroid membrane and then oriented at an angle of 30° laterally and 60° superiorly. We reached TAM with a submucosal approach. The patient was asked to phonate /e:/ several times. Twenty-four patients with hoarseness were included in the study. Eleven patients (46%) were male and 13 (54%) were female. The mean age was 37.62 years (range: 15-57 years). A total of 96 muscles were examined with EMG (Table 1). L-EMG was pathological in 15 patients (62.5%) and bilateral pathology was observed in three patients. Twenty muscles (20.8%) were detected as pathological, with neurogenic involvement in 20 muscles (70%), poor activity or no activity in four muscles (20%) and dystonic activity in two muscles (10%). Eight right CTMs (five as neurogenic involvement, two as poor activity, one as no activity) and five left CTMs (two as neurogenic involvement, one as poor activity, two as dystonic activity) were pathological. Neurogenic involvement was observed in the right TAMs in four patients and in the left TAMs in three patients. The right CTM showed neurogenic involvement in one patient who had had radiotherapy due to nasopharyngeal carcinoma. In endoscopic laryngeal examination, we detected adduction failure in six patients (25%), adduction failure and bowing in eight patients (33.3%), atrophy of the vocal cords in three patients (12%), hypertrophy of the vocal cords in two patients (8.33%), edema in one patient, irregularity in one patient, paralysis in one patient, and polyp in one patient (20%). Regarding endoscopic examination, fourteen patients with abnormalities such as adduction failure and bowing were evaluated as functional disorder, and 10 patients with abnormalities such as nodules, polyps and paralysis were evaluated as organic disorders. L-EMG was normal in two of 14 patients, and 12 patients (85%) had neurogenic involvement. Neurogenic involvement was detected in one patient with Reinke’s edema, in three patients with hypertrophic cord, and in 3 patients with atrophy of the vocal cords (30%). Endoscopic examinations and L-EMG findings of the patients with organic and functional pathology were consistent. While two patients had neurogenic involvement and decreased activity in bilateral CTMs, they also had adduction failure and bowing in the endoscopic examination. The right vocal cord was paralytic in one patient and neurogenic involvement was observed in the right TAM in EMG. The patient, who had atrophy of the right vocal cord in the endoscopic examination, had loss of activity in the right CTM and neurogenic involvement in the TAM in EMG. The importance of L-EMG is based on its diagnostic ability to examine the major peripheral sensory nerves and motor unit, anterior horn cells, axons, and muscle fibers. The structure examined in EMG is the motor unit. The muscle may be normal, or may exhibit neurogenic or myogenic involvement in EMG. The lesion is outside the muscle component of the motor unit in neurogenic involvement. The duration of the motor unit action potential (MUAP) is prolonged, the amplitude increases, the number of phases increases, and the number of observed MUAPs decreases in case of neurogenic involvement. However, in myogenic involvement, the amplitude decreases, the duration is shortened, the number of phases increases, and the early recruitment pattern is observed (4). 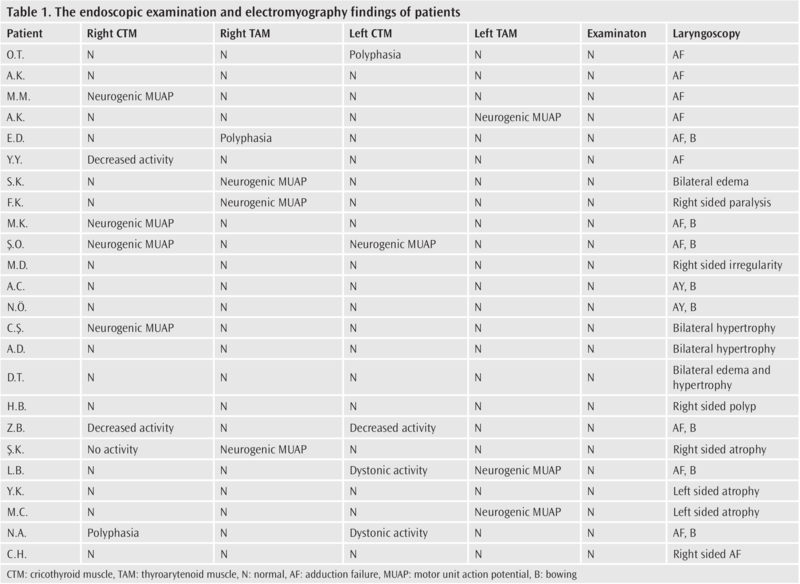 In our study, we observed that 12 of 14 patients with functional disorder and 3 of 10 patients with organic disorders in the endoscopic examination had neurogenic involvement in L-EMG. L-EMG is a diagnostic method that can be used not only to investigate vocal cord paralysis, but also to confirm the location of the lesion, possible etiology, and neuroanatomy. The results may vary depending on the type of electrodes used (5). In a study performed with 110 patients, transcartilaginous electrodes and endotracheal electrode EMG recordings were compared. EMG recordings performed with both electrodes were reported to be reliable. In addition, it was reported that transcartilaginous EMG recordings had higher amplitude and more stable waves. Although there was significant amplitude reduction in endotracheal tube records, there was no significant amplitude reduction in transcartilaginous recordings (6). L-EMG is also used for intraoperative recurrent laryngeal nerve monitoring (7). In a study in ten patients, the researchers used a technique called “airway scope” to monitor recurrent laryngeal nerve and SLN intraoperatively. In this study, vocal cord motion, which occurred by stimulation given to recurrent laryngeal nerve and SLN, was visualized by “airway scope” device and it was reported to be an important technique for surgical safety (8). In this study, we observed the polyphasic MUAPs in L-EMG of one patient with vocal cord paralysis. In accordance with the literature, this made us think that prognosis of the patient would be good. In another retrospective study in 137 patients, L-EMG results showed that SLN, recurrent laryngeal nerve or both were damaged in 94 patients, while 43 patients had normal findings. Twenty five percent of the neurogenic involvement has been reported to be idiopathic, while others have been reported after the treatment of thyroid, parathyroid, lung and pancreatic malignant tumors (9). In our study, we found that 12 of 14 patients with functional disorder and 4 of 10 patients with organic disorder had neurogenic involvement in L-EMG. Radiotherapy induced neuropathy in nasopharyngeal carcinoma was reported as 0.3% to 9% (10). Vestibulocochlear apparatus, hypoglossal nerve and vagus nerve are the most frequently damaged structures. Although vocal cord paralysis due to vagus nerve injury is usually unilateral, bilateral paralysis may occur and may lead to life-threatening airway obstruction (11). Three patients in our study had had radiotherapy for nasopharyngeal carcinoma one year ago and one of these patients had neurogenic involvement in CTM. L-EMG is a safe procedure to detect possible etiology in patients with hoarseness. It should be kept in mind that L-EMG may be an adjunctive application for detecting pathologies with neurogenic or myogenic involvement that affect the superior laryngeal nerve and lead to hoarseness. Ethics Committee Approval: This study was approved by the Local Ethics Committee of İstanbul University Cerrahpaşa Faculty of Medicine (date: 2005, number: 08). Informed Consent: Informed consent was signed by all patients. Author Contributions: Concept - F.Ö. ; Design - A.K. ; Supervision - F.Ö. ; Resources - N.U.A. ; Data Collection and/or Processing - Ş.Ö. ; Analysis and/ or Interpretation - N.U.A. ; Literature Search - M.Ş. ; Writing Manuscript - Ş.Ö. ; Critical Review - F.Ö. Satalof RT, Steven M, Yolanda H, Ramon M. Laryngeal electromyography second edition. 2006; chapter: 1-6. Sanders I, Wu BL, Mu L, Li Y, Biller HF. The innervation of the human larynx. Arch Otolaryngol Head Neck Surg 1993; 119: 934-9. Barczynski M, Randolph GW, Cernea CR, Dralle H, Dionigi G, Alesina PF, et al. External branch of the superior laryngeal nerve monitoring during thyroid and parathyroid surgery: İnternational Neural Monitoring Study group standarts guideline statement. Laryngoscope 2013; (123 Suppl 4): s1-14. Oğul E. Temel nöroloji. Güneş-Nobel Tıp Kitabevleri 2002: 14; 147-58. Lovelace RE, Blitzer A, Ludlow C, Brin MF, Sasaki CT, et al. Clinical electromyography in Neurological disorders of the larynx. New York Time Medical 1992: 66-82. Chiang FY, Lu IC,Chang PY, Dionigi G, Randolph GW, Sun H, et al. Comparison of EMG signals recorded by surface electrodes on endotracheal tube and thyroid cartilage during monitored thyroidectomy. Kaohsiung J Med Sci 2017: 503-9. Donellan KA, Pitman KT, Cannon CR, Replogle WH, Simmons JD. İntraoperative laryngeal nerve monitoring during thyroidectomy. Arch Otolaryngol Head Neck Surg 2009; 135: 1196-8. Ijichi K, Sasano H, Harima M, Murakami S. Monitoring of recurrent and superior laryngeal nerve function using an Airwayscope during thyroid surgery. Mol Clin Oncol 2017; 7: 673-6. Kim MH, Noh J, Pyun SB. Comparison of Clinical Characteristics Between Patients With Different Causes of Vocal Cord Immobility. Ann Rehabil Med 2017; 41: 1019-27. Parsons JT, Fitzgerald CR, Hood CI, Ellingwood KE, Bova FJ, Million RR. The effects of irradiation on the eye and optic nerve. Int J Radiat Oncol Biol Phys 1983; 9: 609-22. Berger PS, Bataini JP. Radiation-induced cranial nerve palsy. Cancer 1977; 40: 152-5.